This was America's first true colonial war as a world power. After defeating Spain in Cuba and in the Philippines in 1898, the U.S. purchased the Philippines, Puerto Rico and several other islands from the Spanish. However, the Filipinos had been fighting a bloody revolution against Spain since 1896, and had no intention of becoming a colony of another imperialist power. 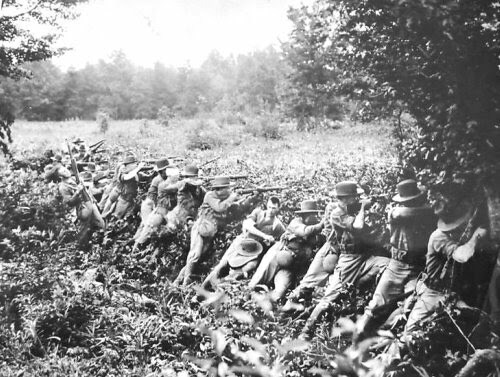 In February of 1899, fighting broke out between the occupying American Army and the Filipino forces. *Quotes are from "Soldier's Letters...", part of an anti-imperialism website formerly operated and edited by the late Jim Zwick. TYPE(S) OF CONFLICT: Inter-State (From the Philippine perspective) and Colonial (From the American perspective). The basic causes of the Philippine-American War can be found in the U.S. government's quest for an overseas empire and the desire of the Filipino people for freedom. In other words, this war was a clash between the forces of imperialism and nationalism. After centuries as a Spanish colony, a revolution led in part by Emilio Aguinaldo broke out in 1896 in the Philippine Islands. After fighting a savage guerilla war for two and a half years, the Filipinos suddenly found themselves in a seemingly advantageous position as allies of the United States. In 1898, Spain fought a losing war with the United States in which her colonies of Cuba, Puerto Rico, and Guam were overrun with relative ease by the U.S. Army and her Atlantic Fleet devastated outside of Santiago, Cuba. Similarly, Spain's Pacific Fleet was wiped out in the Battle of Manila Bay, and American troops landed on the outskirts of the capitol city. Following the surrender of the Spanish colonial government in the Philippines to American military forces in August,1898, tensions developed between U.S. and Filipino forces near Manila. The American government decided to keep the Philippines as a colony, thereby denying independence to the Filipino people. Aguinaldo and his army of nearly 80,000 veteran troops realized that their "allies" in the Spanish War would soon become foes. As early 1899, U.S. and Filipino forces faced off as a tense situation became worse. American forces held the capitol of Manila, while Aguinaldo's army occupied a trench-line surrounding the city. On the evening of February 4, 1899, Private William Grayson of the Nebraska Volunteers fired the first shot in what would turn out to be a very bloody war. Grayson shot at a group of Filipinos approaching his position, provoking an armed response. Shooting soon spread up and down the ten-mile U.S.-Filipino lines, causing hundreds of casualties. Upon the outbreak of hostilities, U.S. troops, supported by shelling from Admiral Dewey's fleet, quickly overwhelmed the Filipino positions while inflicting thousands of casualties. Within days, American forces spread outward from Manila, using superior firepower, mobile artillery and command of the sea to full effect. By November of 1899, Aguinaldo and his forces had been pushed further and further into central Luzon (the main Philippine island) and he realized he could not fight the Americans with conventional military units. At this point, he ordered his followers to turn to guerilla tactics to combat the American army. From this point on, the war became a savage, no-holds-barred guerilla conflict made up of ambushes, massacres and retribution. Both sides engaged in wanton violence and slaughter. Villages were destroyed, civilians murdered, prisoners tortured and mutilated along with a host of other atrocities. Many American officers and non-coms had served in the Indian Wars, and thus applied the old belief that "the only good Indian was a dead Indian" to their relations with the Filipinos. This attitude of course was reciprocated by the native forces. Emilio Aguinaldo was captured in March, 1902, and organized opposition from his followers soon faded. Despite the official end to hostilities proclaimed on July 4, 1902, individual tribes in Luzon and the Muslim Moros of the southern islands launched further uprisings for another decade or so. 1. Independence for the Philippines was delayed until 1946. 2. The United States acquired an overseas colony which served as a base for U.S. business and military interests in the Asia/Pacific region. 3. Following the conclusion of major hostilities, the U.S. did it's best to "Americanize" the Philippines. Through successful civilian administration, the Islands were modernized and the nation prepared for eventual independence. The Philippines became an independent nation on July 4, 1946. U.S.-- 4,234 dead and 2,818 wounded. Philippines-- 20,000 military dead and 200,000 civilian dead. (approximate numbers). Some historians place the numbers of civilian dead at 500,000 or higher. 1. This was the first major land campaign fought by the U.S. outside of the Western Hemisphere. 2. The Philippine-American War can be considered America's first "Imperialistic" conflict. 1. In Our Image: America's Empire In The Philippines. 1989, by Stanley Karnow. pp. 75-195. 2. The Wars of America. 1981, by Robert Leckie. pp. 563-574. Philippine-American War--Summary of the Philippine-American War (1899-1902), from Veltisezar Bautista's book, The Filipino American. Philippine Scouts Heritage Society--The site is intended to help support the mission of preserving the history, heritage and legacy of the Philippine Scouts for present and future generations. Small Wars Manual's Strategical and Psychological Principles in Philippine Counterinsurgency--consideration of Small Wars psychological principles looking at the Philippine War experience. NARA - Prologue - Prologue: Selected ArticlesResearching Service in the US Army During the Philippine Insurrection --Resources from the U.S. National Archives on the Philippine-American War. Filipino Lessons For America Strategy In Iraq----An analysis comparing warfare in the Philippines to the war in Iraq. The Saga of David Fagen: Black Rebel in the Philippine Insurrection--The story of an African-American soldier who joined the Filipino forces opposing the United States. The Philippine History Page: The Filipino Perspective--A Brief History of the Philippines from a Filipino Perspective. The Spanish-American War Centennial Site-- A very ambitious site delving into all aspects of the Spanish American War, including the issues of Cuba, Philippines, Puerto Rico, Guam, and the U.S. home front. Definitely worth looking at! Medal of Honor Recipients for the Philippine Insurrection-- From the U.S. Army website. A listing of American military personnel who won the Medal of Honor in the Philippine War. Named Campaigns of the Philippine Insurrection--A listing of U.S. Army campaigns in the Philippine War. From the U.S. Army website. Soldier's Letters: Materials for the History of a War of Criminal Aggression--Part of a very good website dealing with the issue of Anti-Imperialism. The Swish of the Kris-- This site offers the text of a history book written long ago detailing the Moros of the Southern Philippine islands. The Moros fought both the Spanish and the Americans as well as the modern Manila government. Historyguy.com "The History Guy: Philippine-American War 1899-1902"